In Budapest, But Dreaming of Istanbul. No, the blog is not dead yet, just resting. If I have to blame anything for the sparse posting of late, two things come to mind. First, I have to finish a couple of book length works for a publisher in the States, people who actually contribute to me paying the rent and eating and other worldly functions necessary to the running of an Ethnomusicological Empire. Second: my camera died. My beloved Nikon Coolpix has reached the age (two years) at which digital cameras remember that their owners should go out and buy a new digital camera, preferably from the same maker who produced the last camera that died at the age of two years… So without fresh visual aids to spur me on, I haven’t been posting pictures of freshly caught trout, fiddling ethnicities, or Japanese food made from Slovak ingredients. But then I realized I was leaving all you readers out there in Blog Land in the lurch. I have a hard drive stuffed with photos. I don’t have to blog my latest lunch each week. I can blog lunches from ages ago and you would never complain. And so I shall. My last Nikon Coolpix did not actually die on me. It was stolen in Istanbul in 2010. Luckily, Fumie was there with her Nikon, which did not get nicked. So these photos are from Fumie... which kind of explains why they are so frigging better than photos taken by me. And since our favorite food blogger Robyn at The Girl Who Ate Everything is headed to Istanbul soon, I figured she could use a heads up on where to chow down in Byzantium. First, Istanbul is all about lamb. For the best lamb, the Siirt Market in Fatih, right next to the Aqueduct that crosses Ataturk Bulevard. 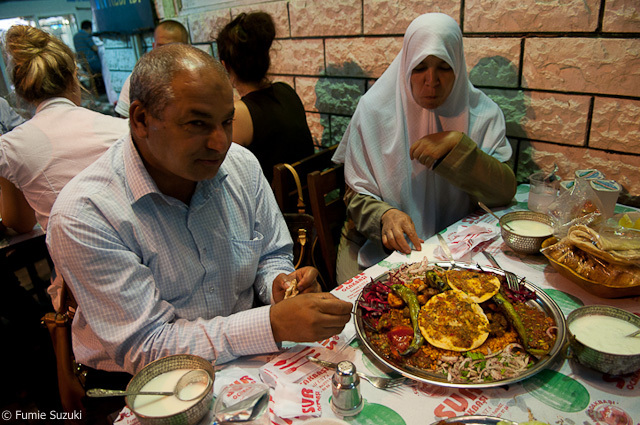 We visited during Ramadan, and each evening devout Muslims broke their fast at dusk with the special iftar plate on sale at the tandoor roasted lamb places that ring the market. Buryan kebab, a whole lamb hung in an underground oven, is thought of as a winter food, but the market places serve it all year long, as well as perde pilav, a chicken pilaf baked inside a pastry shell that has never lived up to its reputation. 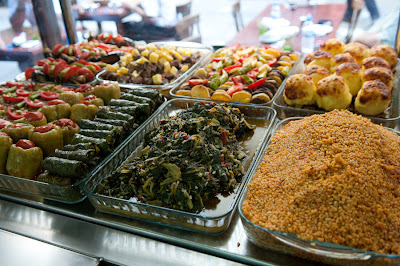 During the daytime the Siirt Market is one of the best traditional food markets in downtown Istanbul. Most of the vendors come from Arab speaking area of South Turkey around the town of Siirt, and the salgam suyu is some of the best to be found. Salgam suyu is a sour pickle juice made from fermented red turnips, carrots and beets. Sounds lovely, doesn’t it? 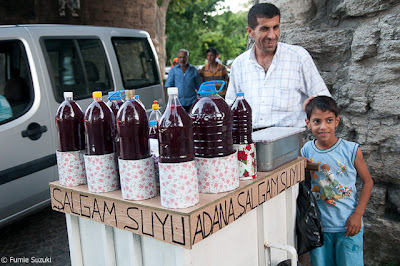 It is a common drink to chase raki when drinking at a kebab house, and in the summer heat I found kit to be the most refreshing drink around – until I discovered what drinking two liters of beet juice a day does to the color of your natural waste maintainance sytem. Blue! The rarest color in nature… and it came out of … me! I use a modicum of restraint after that. 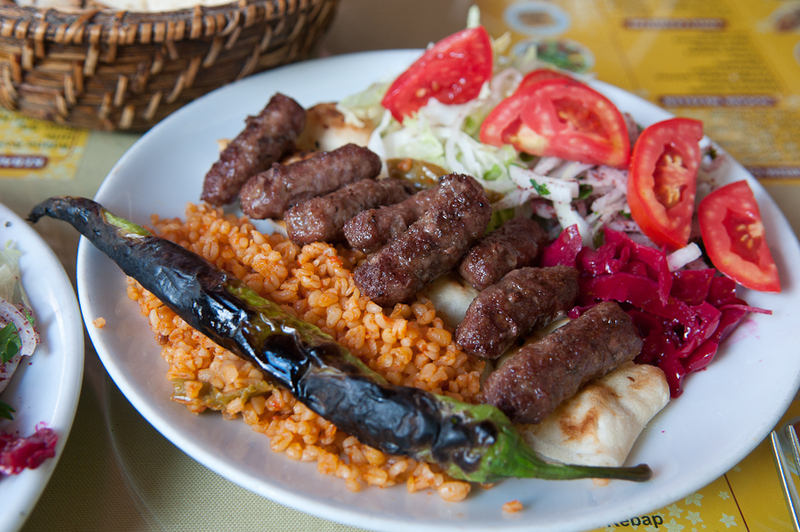 It is nearly impossible to say which is the best kebab joint in Istanbul. There are so few bad ones. 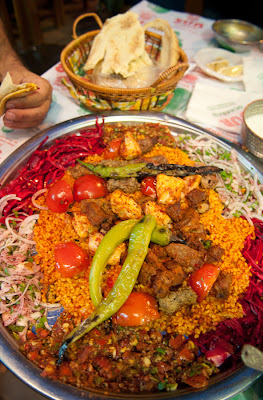 But my favorite was the Kardesler Kebabci inCihangir. And I always suggest that when visiting the Karakoy neighborhood, nose around the old Arap Dzami Mosque until you find the kebab place in the cement market. 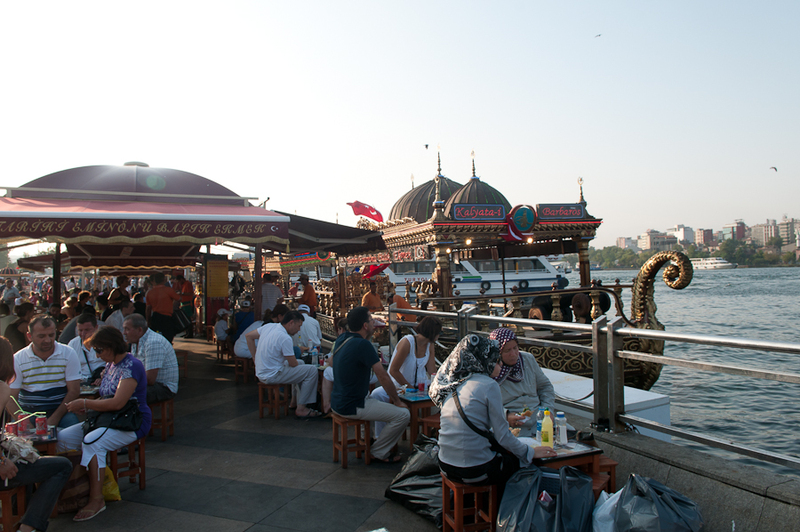 Of course, there is always a fish sandwich available from the boats which used to line the ferry docks at Eminonu. Lately these have been regulated out of the city proper. Only a couple still work the ferry docks, and word is that most of the fish (bonito) is imported frozen. But it is still a cheap option for seafood. OF course, so are the fish markets. 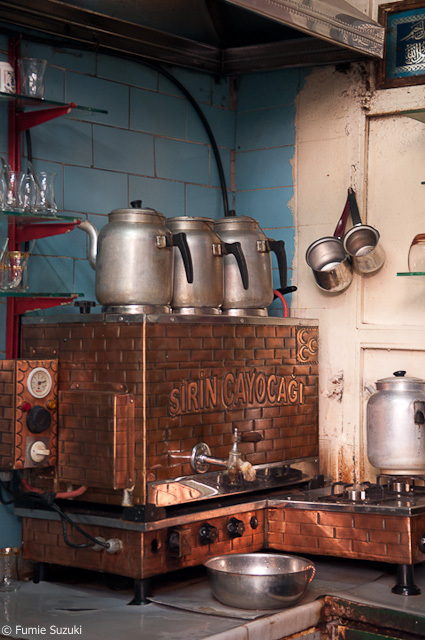 The famous one in Beyoglu is in the Cicegi Pasaj, supplying the meyhanes nearby. Originally Beyoglu was the Pera neighborhood of Ottoman times, a place where westerners and Jews lived and freely drank alcohol, which in the Mediterranean always means eating and music as well as imbibing. And since a poor man's penny is as welcome as a rich man's, the vendors have something for every budget, including bulgur stuffed kofte shells of the most intimate sort. 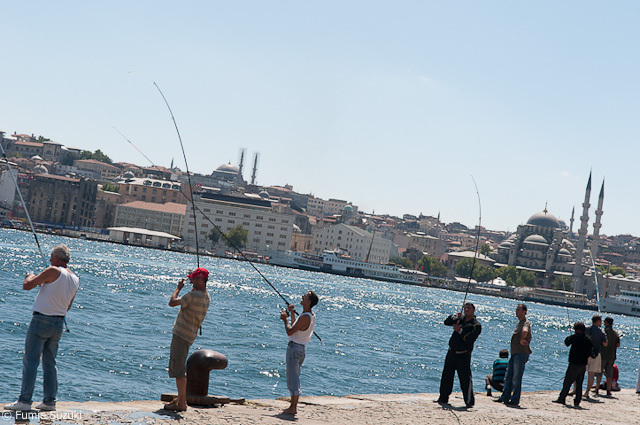 Unfortunately, we may not be able to get to Istanbul this year. We traveled there quite regularly for a decade - waiters and tea shop owners would expect us back and usher us to our favorite table on our return. And although I have tracked down the best Turkish restaurants in Budapest (and Berlin and Vienna and...) here are some basic things that just do not travel - like decent kofte or good stuffed vegetable restaurants. But... somehow we will survive. Until we get back to Turkey.